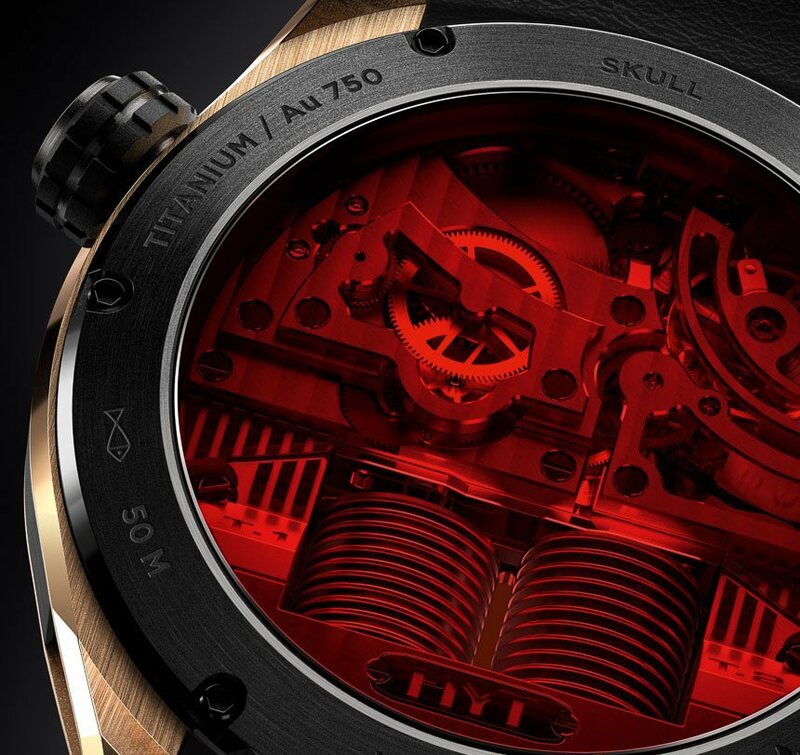 HYT, the "Hydromechanical Horologists" released their third watch model - the HYT Skull. Once again, HYT has created a never before seen design. Skull watches might not be anything new, but the HYT Skull is the first futuristic skull watch to enter the watch game. The most interesting part of the HYT Skull is that it doesn't indicate minutes. The HYT Skull will be offered in two versions, one will be in DLC black titanium with green liquid, and the other will be in 18k rose gold with DLC black titanium and will feature red colored liquid. They are individually known as the HYT Skull Green Eye and HYT Skull Red Eye – and come in a new HYT case size of 51mm wide and 17.9mm thick. According to Ariel Adams from ablogtowatch.com, "inside the HYT Skull watches are exclusive HYT movements. You have an integration of their proprietary bellows and capillary system to move the liquid, which can be seen under the skull's "teeth." The rear of the case is viewable through a sapphire crystal window, offering a nice look into the movement. The movement operates at 4Hz (28,800 bph), with a power reserve of about 65 hours. I like the traditional mentality behind designing it along with the modern aesthetics. Of course, the matching green or red tinted sapphire crystal is a nice touch which adds to the overall presentation of the HYT Skull watch." Newer PostWatch Style: Limited Edition Hublot King Power Arturo Fuente "Cigar Watch"